About: Everything from setting up kitchen cabinets to learning more about your child’s developmental needs. Explore each area of the home environment, learn strategies for teaching new skills, and explore a framework for evaluating your own home environment in a way that suits your family’s needs. Topics: Integrating the Montessori philosophy at home & understanding methods to augment your home environment in support of your child’s development and independence. Why: Learn strategies for implementing the Montessori philosophy at home to provide continuity between home and school. This continuum will help your child gain the most from her Montessori education. 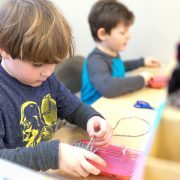 Follow the Child Montessori School, Inc. does not discriminate on the basis of race, color, creed, gender/gender identity, age, family structure, sexual orientation, or national and ethnic origin in administration of its educational policies or other school-administered programs.